Obtaining your certification is a giant step forward in furthering your career as a phlebotomist and increasing your salary. And if you live in California, Nevada or Louisiana, certification is required before you can even become a practicing phlebotomist. There are many phlebotomy certification organizations out there, however, they are not all created equal. So, to ensure you don't waste your time or money on a useless certification, check out our list of the 7 best and most reputable phlebotomy certification agencies below. 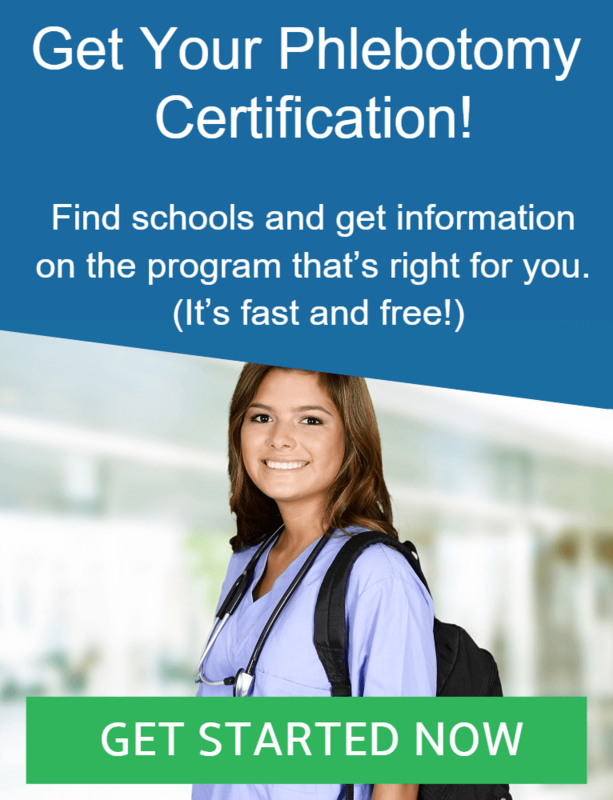 The American Certification Agency for Healthcare Professionals is a national certification organization designed to recognize healthcare professionals who have achieved a standard of knowledge through education and/or experience. American Medical Technologists is a nationally and internationally recognized certification organization based out of Illinois. Their certification exams are created using state-of-the-art testing methodologies using only the highest industry standards. Route 1 : Graduated from an academic course in phlebotomy with a minimum of 120 didactic hours. Route 2 : Completed at least 1,040 hours of phlebotomy work in an approved facility in the past 3 years. In addition to meeting the requirements for one of the two routes above, the applicant must have completed at least 50 venipunctures and 10 skin punctures from a human source. The American Society for Clinical Pathology is the largest professional organization for laboratory professionals in the world. Founded in 1922, the ASCP has grown to over 100,000 members while providing top-notch education and certification. Route 1 : High school graduation (or GED) PLUS completion of an NAACLS accredited phlebotomy program in the last 5 years. Route 2 : High school graduation (or GED) PLUS completion of a two-part phlebotomy program consisting of 40 clock hours of classroom training and 100 hours of clinical training in an accredited lab. Also minimum of 100 successful blood draws. Route 3 : High school graduation (or GED) PLUS at least one full year (35 hours a week) of phlebotomy technician experience in an accredited laboratory in the last 5 years. Route 4 : High school graduation (or GED) PLUS completion of RN, LPN or other allied healthcare professional that includes phlebotomy training. Route 7 : High school graduation (or GED) PLUS completion of a phlebotomy course that has been approved by the California Department of Public Health in the last 5 years. The American Society of Phlebotomy Technicians provides certification to trained phlebotomists, continuing education, newsletters, cross-training programs and more! The ASPT is the second oldest certifying organization having been founded in 1983. Founded in 1989, the National Center for Competency Testing is an independent certification organization for healthcare professionals and instructors. They offer an NCPT certification for phlebotomy technicians. The National Healthcareer Association has certified over 500,000 health professionals since its inception over 25 years ago. The NHA offers nationally recognized certifications and is itself accredited by the National Commission for Certifying Agencies (NCCA). The National Phlebotomy Association was founded by Diane Crawford in 1978 to help establish a standard and code of ethics for health care professionals. They provide excellent continuing education classes, accreditation, certification and much more.